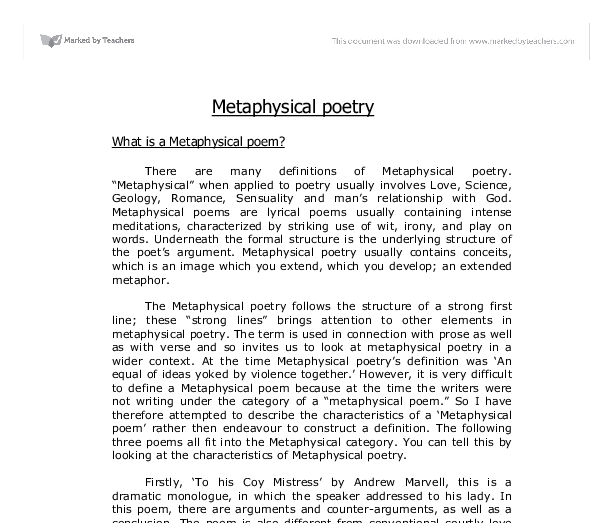 Metaphysical poetry What is a Metaphysical poem? There are many definitions of Metaphysical poetry. "Metaphysical" when applied to poetry usually involves Love, Science, Geology, Romance, Sensuality and man's relationship with God. Metaphysical poems are lyrical poems usually containing intense meditations, characterized by striking use of wit, irony, and play on words. Underneath the formal structure is the underlying structure of the poet's argument. Metaphysical poetry usually contains conceits, which is an image which you extend, which you develop; an extended metaphor. The Metaphysical poetry follows the structure of a strong first line; these "strong lines" brings attention to other elements in metaphysical poetry. The term is used in connection with prose as well as with verse and so invites us to look at metaphysical poetry in a wider context. At the time Metaphysical poetry's definition was 'An equal of ideas yoked by violence together.' 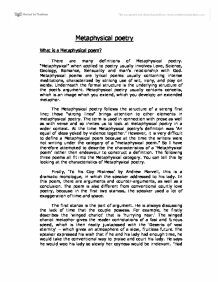 However, it is very difficult to define a Metaphysical poem because at the time the writers were not writing under the category of a "metaphysical poem." So I have therefore attempted to describe the characteristics of a 'Metaphysical poem' rather then endeavour to construct a definition. The following three poems all fit into the Metaphysical category. You can tell this by looking at the characteristics of Metaphysical poetry. Firstly, 'To his Coy Mistress' by Andrew Marvell, this is a dramatic monologue, in which the speaker addressed to his lady. ...read more. "Let us roll all our strength and all our sweetness up into one." Marvel has very cleverly used the urgency in the poem to apply to time and sexual activity. There is an image of someone who is toothless and this represents time. The end of the poem used monosyllabic words "Yet we will make him run" and this is a common characteristic of a metaphysical poem. In many of Marvell's poems we find the same eight syllable iambic line, yet its effect can vary remarkably. The vigorousness of the argument appears in the breathless lines. Few lines are end-stopped, and the lines have rough power of speech. In addition, Marvell manages to marry a syllogistic framework with a passionate poem of seduction. The second poem is written by John Donne "Elegie: To his Mistress going to Bed." The beginning of this poem is a classic sign of a metaphysical poem; it has a very strong and dramatic opening. It contains images of war and has alternative images all the way through, this is classic of a metaphysical poem. The subject is then changed to astronomy; Donne is talking about a "Geocentric universe." He also uses a clich� from pastoral poetry, " Flowery meeds th' hills shadow steales." The similarities in the metaphysical poems that focus on religion is that poets often stretch the boundaries of what would have been acceptable at that time. ...read more. The flea becomes a beautiful, weightless object. Donne uses another common characteristic of Metaphysical poetry, he is 'over-doing' the melo-drama and using an alliteration: 'false, fears bee.' The final line finishes the poem in the typical way in which all of the Metaphysical poems end this is with monosyllabic words. The final line is about honour, which has very little to do with the rest of the poem it is false logic, yet emphatic. This is common structure for a Metaphysical poem, finishing with a complete change of direction in the argument. So to summarize, Metaphysical poetry can involve love, science and religion. Usually this follows a structure of beginning with a powerful line to start and prolonging the conceit all the way through the poem. Marvell uses this particularly technique quite often, drawing upon philosophy to illustrate his argument and giving the poem an intellectual appeal, not just a visual one. Also underneath this formal structure is the poems argument. The poems follow a structure within a syllogistic framework, which begins with an initial foundation, then introduces a requirement to the foundation, and ends with a resolution to the conflict. The three poems I have studied have contained wit, clich�s, irony, word play and alliterations; all theses things make up a good Metaphysical poem. Although the poems I have studied have different subject matters they have all contained the main components and have been written with wonderful use of language. Both Donne and Marvell are extremely intelligent which is way they managed to write such great poetry. By Claire Gittoes ...read more. This student written piece of work is one of many that can be found in our University Degree Donne section. harvest of thorns of blood-letting, Paradise is a garden where winter never comes, severity is a rod and love is God�s bow or the host at a banquet. what is beyond it, instead, the poets seem to be more secure with their reality and question lifeless objects instead. The former kind of love is dependent on being physically together, whereas the speaker and his beloved's love is refined and 'Inter-assur�d[sic]'6 and therefore they do not need to worry about 'eyes, lips, and hands. '7 The speaker does not recognise his going away as a separation; he sees it as an 'expansion'8. Love in the Poetry of John Donne. All that is left for me is to draw your attention to the last line. Even with the ceaseless evolution of his sublunary universe Donne remains convinced that God is the creator and donor of love and the universe. Amongst all the inconsistencies and paradoxes of his writing: God is love. "...'Twere profanation of our joys/ To tell the laity of our love..." This line is saying that their love is so profound, special and unique that they shouldn't publicise it. This awareness includes what they are thinking, feeling and doing. Lack of insight leads to many human dilemmas. Failure to achieve full awareness can result in what is known as "unfinished business", where some event in the individual's past was not resolved to their satisfaction (Clarkson 1989).